Mom probably told you a lot of things growing up that may have seemed silly. “Keep making that face and it’ll freeze that way!” and “Don’t look at me with those eyes!” And, of course, coming back with a retort, like “These are the only eyes I have,” was never in your best interest. But the truth is … they really are the only eyes you have. And if you ever heard her tell you “Don’t stare into the sun, you’ll hurt your eyes,” you can thank her for that one because she was absolutely right. We already know ultraviolet (UV) rays can damage our skin, cause wrinkles and skin cancer (melanoma). But did you know it can also damage your eyes? UVA rays cause aging in skin cells and can damage the DNA. They can cause long-term skin damage and are responsible for wrinkles. They have also been linked to skin cancer. UVB rays have more energy than UVA rays. They directly damage the DNA of skin cells and are the main cause of sunburn. They are the rays most responsible for skin cancer. Macular Degeneration (AMD) is caused by damage to the retina over time and is the leading cause of age-related blindness. Extended exposure to UV light increases your risk of developing macular degeneration. A cataract is a clouding of the eye’s natural lens—the part of the eye that focuses the light we see. UV light, especially UV-B rays, increases your risk for certain types of cataracts. It is estimated that 10% of all cataract cases are directly attributable to UV exposure. Often called “surfer’s eye,” pterygium is a pink, non-cancerous growth that forms on the layer of conjunctiva over the white of your eye. UV light from the sun is believed to be a factor in the development of these growths. The skin of the eyelids is very thin. So even if your eyes are closed, you can do damage to your eyes by exposing the lids to the sunlight. Skin cancer in and around the eyelids is also linked to prolonged UV exposure. Also known as corneal sunburn or “snow blindness,” photokeratitis is the result of high short-term exposure to UV-B rays. Long hours at the beach or skiing without proper eye protection can cause this problem. It can be very painful and may cause temporary vision loss. If you spend a lot of time outdoors in bright sunlight, consider wearing wraparound frames for additional protection from the harmful solar radiation. And never, ever look directly at the sun. Looking directly at the sun at any time, including during an eclipse, can lead to solar retinopathy, which is damage to the eye’s retina from solar radiation. So, go thank your mom and tell her she was right! American Academy of Opthalmology, American Optometric Association and the Skin Cancer Foundation. Exposure to UV radiation—whether from the sun or from artificial sources such as sunlamps used in tanning beds—increases the risk of developing skin cancer, according to the National Cancer Institute (NCI). Melanoma, the deadliest form of skin cancer, is linked to getting severe sunburns, especially at a young age. “Although some people think that a tan gives them a ‘healthy’ glow, any tan is a sign of skin damage,” says Sharon Miller, M.S.E.E., a Food and Drug Administration (FDA) scientist and international expert on UV radiation and tanning. Both UV-B and UV-A rays damage the skin and can lead to skin cancer. Tanning salons use lamps that emit both UV-A and UV-B radiation. IARC concluded that there is convincing evidence of an association between the use of indoor tanning equipment and melanoma risk, and that the use of tanning beds should be discouraged. Premature aging. Tanning causes the skin to lose elasticity and wrinkle prematurely. This leathery look may not show up until many years after you’ve had a tan or sunburn. Immune suppression. UV-B radiation may suppress proper functioning of the body’s immune system and the skin’s natural defenses, leaving you more vulnerable to diseases, including skin cancer. Eye damage. Exposure to UV radiation can cause irreversible damage to the eyes. Allergic reaction. Some people who are especially sensitive to UV radiation may develop an itchy red rash and other adverse effects. Advocates of tanning devices sometimes argue that using these devices are less dangerous than sun tanning because the intensity of UV radiation and the time spent tanning can be controlled. But there is no evidence to support these claims. In fact, sunlamps may be more dangerous than the sun because they can be used at the same high intensity every day of the year—unlike the sun whose intensity varies with the time of day, the season, and cloud cover. The FDA believes that limiting sun exposure and using sunscreen or sunblock are particularly important for children since these measures can prevent sunburn at a young age. NCI reports that women who use tanning beds more than once a month are 55 percent more likely to develop melanoma. Teenage girls and young women make up a growing number of tanning bed customers. Yet of the more than 68,000 people in the U.S. who will learn they have melanoma this year, one out of eight will die from it, according to NCI estimates. In addition, the American Academy of Dermatology reports that melanoma is the second most common cancer in women 20 to 29 years old. Some states are considering laws to ban those under age 18 from using tanning beds. And many states now have laws that require minors to have a parent’s consent or be accompanied by a parent to the tanning facility. “Parents should carefully consider the risks before allowing their children under 18 to tan,” says Miller. The FDA, NCI, the American Academy of Dermatology, and other health organizations advise limiting exposure to natural UV radiation from the sun and avoiding artificial UV sources such as tanning beds entirely. Failing to wear the goggles provided, which can lead to short- and long-term eye injury. Starting with long exposures (close to the maximum time for the particular tanning bed), which can lead to burning. Because sunburn takes 6 to 48 hours to develop, you may not realize your skin is burned until it’s too late. Failing to follow manufacturer-recommended exposure times on the label for your skin type. Tanning while using certain medications or cosmetics that may make you more sensitive to UV rays. Talk to your doctor or pharmacist first. Did you know? Skin cancer is the most common cancer in the United States? Yet most skin cancers can be prevented. Every year, there are 63,000 new cases of and 9,000 deaths from melanoma—the deadliest form of skin cancer. Ultraviolet (UV) exposure is the most common cause of skin cancer. A new CDC study shows that the majority of Americans are not using sunscreen regularly to protect themselves from the sun’s harmful UV rays. In fact, fewer than 15% of men and fewer than 30% of women reported using sunscreen regularly on their face and other exposed skin when outside for more than 1 hour. Many women report that they regularly use sunscreen on their faces but not on other exposed skin. What is important to remember is that the sun produces dangerous UV rays, whether it’s sunny or a cloudy day. UV rays, which can penetrate cloud cover, damage the DNA of skin cells, which causes the melanin in the body to rush to that site and try to compensate for the damage. Melanin is responsible for the pigment (color) of your skin. So when this happens, the skin changes color … pink or red for some, tan or brown for others. Whichever color your skin becomes (sunburn or suntan), both are a result of damaged skin cell DNA caused by ultraviolet rays. Sometimes this damage affects certain genes that control how skin cells grow and divide. If these genes no longer work properly, the affected cells may become cancer cells. Use broad spectrum sunscreen with SPF 15+ to protect any exposed skin. Seek shade, especially during midday hours. Wear sunglasses, a hat that covers your ears, and other clothes to protect skin. Sunscreen works best when used with shade or clothes, and it must be re-applied every two hours and after swimming, sweating and toweling off. It’s beach time! But when you bring your family to the beach, how do you protect your little ones? Sunscreens are recommended for children and adults. But what about babies? According to Hari Cheryl Sachs, M.D., a pediatrician at the Food and Drug Administration (FDA), infants under 6 months of age should be kept out of the sun. Sachs says the best protection is to keep your baby in the shade, if possible. And if there’s no natural shade, create your own with an umbrella or the canopy of the stroller. “If there’s no way to keep an infant out of the sun, you should check with your pediatrician about what to do for your baby.” If your pediatrician agrees, you can apply a small amount of sunscreen—with a sun protection factor (SPF) of at least 15—to small areas such as the cheeks and back of the hands. Sachs suggests testing your baby’s sensitivity to sunscreen by first trying a small amount on the inner wrist. The best way to protect an infant in the sun is to keep skin from being exposed. As much as possible, the American Academy of Pediatrics (AAP) suggests dressing infants in lightweight long pants, long-sleeved shirts, and brimmed hats that shade the neck to prevent sunburn. Use a hat with a brim that covers your baby’s neck and ears they don’t shade the neck and ears, sensitive areas for a baby. “In the heat, babies are also at greater risk of becoming dehydrated. To make sure they’re adequately hydrated, offer them their usual feeding of breast milk or formula,” says Sachs. “The water content in both will help keep them well hydrated. Keep your baby in the shade as much as possible. Consult your pediatrician before using any sunscreen on your baby. If you do use a small amount of sunscreen on your baby, don’t assume the child is well protected. Make sure your child wears clothing that covers and protects sensitive skin. Use common sense; if you hold the fabric against your hand and it’s so sheer that you can see through it, it probably doesn’t offer enough protection. Make sure your baby wears a hat that provides sufficient shade at all times. Watch your baby carefully to make sure he or she doesn’t show warning signs of sunburn or dehydration. These include fussiness, redness and excessive crying. Hydrate! Give your baby formula or breast milk if you’re out in the sun for more than a few minutes. Don’t forget to use a cooler to store the liquids. Take note of how much your baby is urinating. If it’s less than usual, it may be a sign of dehydration, and that more fluids are needed until the flow is back to normal. Avoid combination sunscreens containing insect repellants like DEET. Young children may lick their hands or put them in their mouths. According to the AAP, DEET should not be used on infants less than two months old. If you do notice your baby is becoming sunburned, get out of the sun right away and apply cold compresses to the affected areas. July is UV Safety Month … and for good reason. Protection from ultraviolet (UV) radiation is important all year round. However, exposure to UV rays from sunlight is the greatest during the summer months. This is because you’re spending more time outside. You’re near or in the water. And you’re wearing less and/or lighter clothing than in the colder months. So your skin is more exposed to potentially damaging rays. The sun’s UV rays can damage your skin in as little as 15 minutes. UV rays from the sun can reach you on cloudy and hazy days, as well as bright and sunny days, because clouds block visible light, not UV. Many people don’t realize they are getting too much sun when it is overcast or if there is a light wind. The hours between 10 a.m. and 4 p.m. are the most hazardous for UV exposure outdoors. UV rays reflect off of surfaces like water, cement, sand and snow. So days spent at the beach or near a pool, are crucial times to apply and reapply sunscreen and take protective measures, such as wearing a wide-brimmed hat. Suntanners beware. It doesn’t matter that you have that envious olive color skin. You are still damaging your skin. We hear it all the time: “I don’t burn; I tan. So I don’t have to worry.” Wrong! When your skin is exposed to UV rays, your body makes melanin to try to protect the deeper layers of your skin from damage. Melanin is what gives your skin color. Some people produce more melanin, so their skin is naturally darker. When your skin is damaged by the sun’s rays, your body’s defense mechanism is to make more melanin to shield your skin cells from additional damage. The melanin absorbs ultraviolet light and causes the skin to change color. Those who produce more melanin will typically tan. Those who are fair-skinned do not produce as much melanin, so instead of tanning, they just burn. But even those who tan can get a sunburn if they spend a lot of time out in the sun. The result is still that the UV rays are actually damaging the DNA of your skin cells. Once this happens, those cells die and the body’s reaction to this is to begin flooding the area with blood to help with the healing process. And as you can guess, that is what causes the bright red glow of a sunburn. So no matter which camp you fall in, you should always wear sunscreen before going outside. Here are some additional recommendations to help protect yourself and your family. Stay in the shade, especially during midday hours. Wear clothing that covers your arms and legs. Wear a hat with a wide brim to shade your face, head, ears and neck. Wear sunglasses that block both UVA and UVB rays. Use sunscreen with sun protection factor (SPF) 15 or higher, and both UVA and UVB protection. You can reduce your risk of skin damage and skin cancer by seeking shade under an umbrella, tree, or other shelter before you need relief from the sun. Your best bet to protect your skin is to use sunscreen or wear protective clothing when you’re outside—even if you’re in the shade. Clothes made from tightly woven fabric offer the best protection. A wet T-shirt offers much less UV protection than a dry one, and darker colors may offer more protection than lighter colors. Some clothing certified under international standards comes with information on its UV protection factor. If wearing this type of clothing isn’t practical, at least try to wear a T-shirt or a beach cover-up. Keep in mind that a typical T-shirt has an SPF rating lower than 15, so use other types of protection as well. For the most protection, wear a hat with a brim all the way around that shades your face, ears and the back of your neck. A tightly woven fabric, such as canvas, works best to protect your skin from UV rays. Avoid straw hats with holes that let sunlight through. A darker hat may offer more UV protection. If you wear a baseball cap, you should also protect your ears and the back of your neck by wearing clothing that covers those areas, using sunscreen with at least SPF 15, or by staying in the shade. Sunglasses protect your eyes from UV rays and reduce the risk of cataracts. They also protect the tender skin around your eyes from sun exposure. Sunglasses that block both UVA and UVB rays offer the best protection. Most sunglasses sold in the U.S., regardless of cost, meet this standard. Put on broad spectrum sunscreen with at least SPF 15 before you go outside, even on slightly cloudy or cool days. Don’t forget to put a thick layer on all parts of exposed skin. Be careful not to forget ears, tops of feet, behind your knees, and other spots that might be exposed. Get help for hard-to-reach places like your back. And remember, sunscreen works best when combined with other options to prevent UV damage. How sunscreen works. Most sun protection products work by absorbing, reflecting, or scattering sunlight. They contain chemicals that interact with the skin to protect it from UV rays. All products do not have the same ingredients; if your skin reacts badly to one product, try another one or call a doctor. SPF. Sunscreens are assigned a sun protection factor (SPF) number that rates their effectiveness in blocking UV rays. Higher numbers indicate more protection. You should use a broad spectrum sunscreen with at least SPF 15. Reapplication. Sunscreen wears off. Put it on again if you stay out in the sun for more than two hours and after swimming, sweating or toweling off. Expiration date. Check the sunscreen’s expiration date. Sunscreen without an expiration date has a shelf life of no more than three years, but its shelf life is shorter if it has been exposed to high temperatures. Cosmetics. Some makeup and lip balms contain some of the same chemicals used in sunscreens. If they do not have at least SPF 15, don’t use them by themselves. We’re coming up on the 4th of July. Hooray for long weekends, parties, good food and good times! Of course, we should never forget why we are actually blessed with this 3-day weekend. So we celebrate the birthplace of our nation with cheer, American flags, ceremonies and (of course) fireworks. Unfortunately, this is also the time of year when the emergency department sees a bit of an uptick in the number of abrasions, burns and more serious injuries stemming from these brightly burning festive sticks of fire. So, this is why we urge you to please, please leave the fireworks to the professionals! 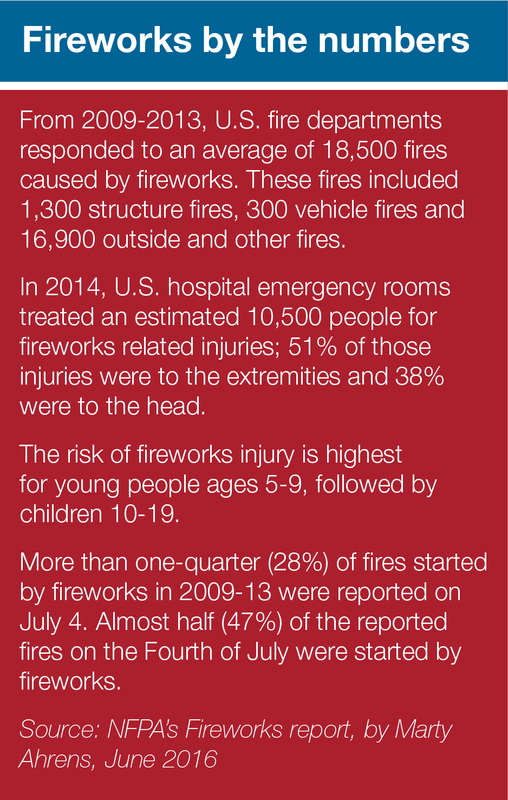 According to the U.S. Consumer Product Safety Commission (CPSC), eight people died and more than 11,000 were injured badly enough to require medical treatment after fireworks-related incidents in 2013. Additionally, fireworks caused an estimated 15,600 reported fires in the U.S., including 1,400 structure fires, 200 vehicle fires, and 14,000 outside and other fires. There are no such thing as completely safe fireworks. But there are ways to keep you and your family safe during a fireworks celebration. Many people think sparklers are the perfect way for a child to be part of a 4th of July celebration. They can wave them around, make swirls and letters and everyone has a good time. Sparklers can burn anywhere from 1,000 to 2,000 degrees—hot enough to melt some metals. Sparklers can quickly ignite clothing, and many children have received severe burns from dropping sparklers on their feet. The CPSC reports that approximately 16 percent of all consumer fireworks injuries are caused by sparklers burning hands and legs. Young children account for the majority of sparkler injuries. As disappointed as they may be, do not let children younger than 12 hold a sparkler. They often lack the physical coordination to handle sparklers safely and likely will not know what to do in an emergency. Close supervision of older children is necessary. No, we’re not going to tell you to not let your pet play with fireworks. We sincerely hope you already know that is a very, very bad idea! And if not, I guess this serves as us telling you. It is important though to keep pets safe over the 4th of July holiday. And this does include keeping them away from fireworks but not just because of injury. July 5 is the busiest day of the year for pet shelters. This is because so many animals become anxious and frightened by the loud noises of fireworks and escape their yards, homes and leashes. We recommend you leave your pets at home when attending any celebration this weekend. And even at home, you should take precautions even if your pet has never ran away or escaped before. And it’s not just dogs. Many people have barbecues and parties for the holiday. This means a lot of people going in and out of the house, including children, leaving the door open long enough for a quick escape. So it’s probably best to make sure your pet is in a secure inside room with plenty of food and water and someplace to tuck into when the loud noises start. It’s also a time when a lot of different foods are left out and are sometimes dropped on the floor. So there is a greater chance of your pet getting hold of a food that may not be very good for him. Also the ASPCA notes, that citronella-based repellants, oils, candles and insect coils are irritating toxins to pets. The American Veterinary Medical Association and ASPCA recommend that you consider microchipping your pet, even if he spends all his time indoors. And you should be sure the information on the chip is kept up to date with your current phone and address or Veterinarian information. We want this to be an enjoyable, festive and safe holiday weekend for you, and your family (including your pets). So please play it safe and Happy 4th of July! Sources: U.S. Consumer Product Safety Commission, National Council of Fireworks Safety, American Society for the Prevention of Cruelty to Animals, American Veterinary Medical Association. It’s June. And that means backyard barbecues, pool parties and kids home for the summer …which makes it the perfect time to talk about safety! June is National Safety Month. That doesn’t mean you can ignore the rules of safety during the other 11 months of the year. It just means it’s time for us to focus on what it means to practice proper safety methods in everything we do, every day of the year. Wear sunscreen, stay hydrated and seek shade. You can reduce your risk of skin damage and skin cancer by seeking shade or shelter before you need relief from the sun. Your best bet to protect your skin is to use sunscreen or wear protective clothing when you’re outside—even when in the shade. Keep children and pets safe. Do not leave pets or children in hot cars or near a pool alone. It only takes 5-10 minutes for a car to reach dangerous levels! And do not leave your pets outside unsupervised or for long periods of time without shade. They have a much harder time regulating temperature than humans. Don’t let safety take a vacation. Always remain aware of your surroundings while on vacation. Carry your purse or wallet close to your body or in a front pocket. Never share on social media that you are going to be away from your home for an extended period of time. Let someone at home know where you will be at all times and how to reach you in case of emergency. Be safe at the beach. Always swim near a lifeguard stand, and listen to what the lifeguards tell you. Never take your eyes off children and don’t assume the lifeguard or someone else is watching them. Beware of dangerous rip currents, which can occur in any open body of water. If caught in a rip current swim parallel to the shore until you are out of the current, then swim to shore. Never, ever swim alone. Just don’t do it! Even if you’re an excellent swimmer, you can’t plan for every emergency. A child or an adult can drown in mere seconds. Hear thunder? Get out of the water! If you hear thunder, lightning is close enough to strike you. Lightning kills an average of 49 people in the U.S. each year. And in the water is the most dangerous place to be in a storm. Wait at least a half hour after hearing the last rumble of thunder before entering the water again. Secure your backyard pool. Tragically, over 300 children under the age of 5 drown in backyard swimming pools each year. And it is not always even their own pool. 33 percent of drowning incidents happened in a pool owned by friends, relatives or neighbors. So make sure you have the proper enclosure or fencing for your pool, even if you don’t have children. This isn’t just a suggestion. Pool safety barrier guidelines have been written into most residential building codes. Also, children can drown in as little as one inch of water so empty kiddie swimming pools when finished with them as well. Leave the fireworks to the professionals. If you do use fireworks, keep a bucket of water handy and use them in a clear area away from buildings and trees. Make sure to obey your state’s laws regarding fireworks. Never let children use fireworks! When picnicking, carry food in a cooler with cold packs. Keep your cold food cold. Food can spoil much quicker in warmer weather. Clean produce and keep any raw meats separately. Be sure to cook food thoroughly and never reuse utensils or serving plates that have been used to carry raw meats. These are just some of the most important safety tips you should always remember to keep yourself and your family safe. And these apply not only during the summer months but all year round. What are some other summer safety tips you’d recommend?